Plenum cable is made of Fire Retardant Materials, will not burn easily nor emit toxic fumes when exposed to extreme heat. Because of these requirements, Plenum cable is more expensive than non-Plenum cable and Should be used to State and Local Building Codes. Only there will you find what They consider to be Plenum spaces. Consisting of 18 AWG Copper Covered Steel Center Conductor with Bonded Foil over Dialectric with 60% Braid, another Foil layer with a final 40% Aluminum Braid, encased in a White Plenum Low Smoke PVC Jacket. 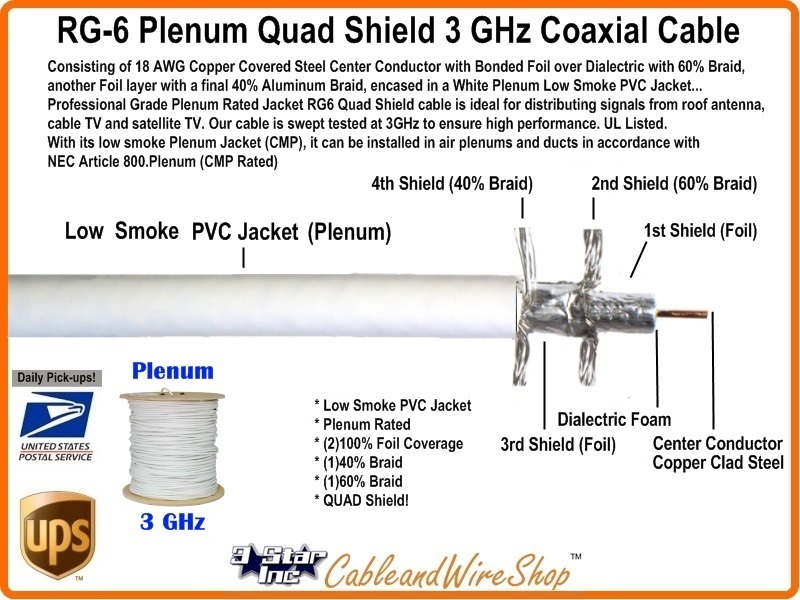 Professional Grade Plenum Rated Jacket RG6 Quad Shield cable is ideal for distributing signals from roof antenna, cable TV and satellite TV. Our cable is swept tested at 3GHz to ensure high performance. UL Listed. With its low smoke Plenum Jacket (CMP), it can be installed in air Plenums and ducts in accordance with NEC Article 800.